It's fun to see multiple works by the same playwright, and look for similarities and differences between them. 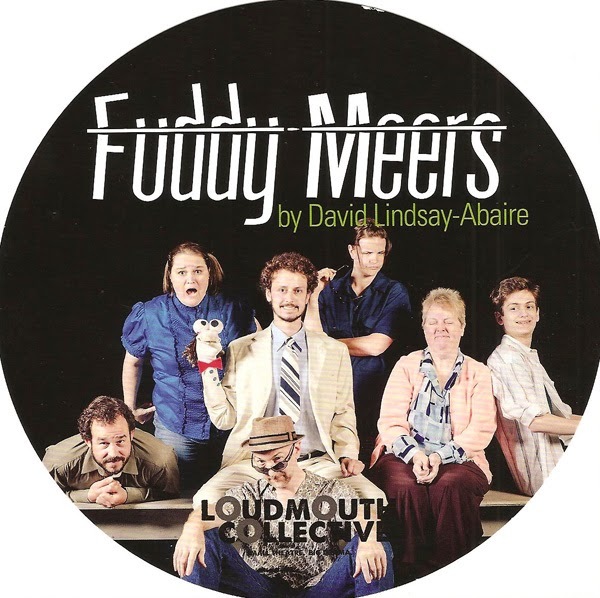 Loudmouth Collective's Fuddy Meers is the third play by David Lindsay-Abaire that I've seen in the last year. I could easily see the similarities between Rabbit Hole and Good People; both are intense family dramas dealing with serious issues with humor and realism. At first glance Fuddy Meers seems to be a bit of an anomaly. The situations are surreal and wildly comic - a woman who wakes every morning with amnesia, the damaged and crazy man who kidnaps her, her mother who speaks in mostly nonsensical sentences, a man who speaks through a sock puppet. While one could easily see oneself and one's friends and families in the characters and scenes in the former two plays, it's a bit of a stretch with Fuddy Meers. But by the end of the play, I could more easily see how it fit with the others - the same relatable and real characters, just in more absurd situations. Fuddy Meers is part mystery, part madcap comedy, and part touching family drama. The mystery comes in as we join amnesiac Claire (Noë Tallen, very charming and open) in her journey to discover who she is and what happened to her. She wakes every morning with no memory, and is therefore happy and childlike, with no memory of the pain she's experienced. Her genial husband Richard (Leif Jurgensen) patiently explains the situation to her, while her surly teenage son Kenny (a completely natural Spencer Harrison Levin) just wants to go about his normal surly teenage life. Claire is surprised by a man (an effectively creepy Matt Sciple) who claims he's there to rescue her from her husband, and takes her to her mother Gertie's house. Gertie has suffered a stroke and has trouble forming sentences (in a quite brilliant performance by Karen Weise-Thompson, who believes every word she's saying, even if the words make no sense). They soon meet the crazy man's friend/accomplice Millet and his hand puppet (Paul Rutledge, equally good as both). Meanwhile, Richard and Kenny go looking for Claire and are waylaid by a cop (Katie Willer). They all end up at Gertie's house, which is where the madcap comedy ensues as the plan goes wrong, guns go off, puppets disclose truths, and everyone reaches their wit's end. The puzzle pieces begin to fall into place, and we learn just what happened and how everyone fits in. In the end, the touching family drama can be seen through the man who loves his wife and the son who loves his mother, and just want her to return to them, which has become a daily process. Loudmouth Collective is a newish theater company, in just their second season, but all of their work that I've seen has been great - interesting choices of smart, well-written, complex plays, and wonderful actors. This cast of seven is large for them; previous pieces have been one- or two-person shows. It's a nice ensemble and they work and play well together, as directed by Artistic Director Natalie Novacek. A fun feature are the dancing scene changes which keep the mood light and the momentum going, and keep the audience from getting bored as furniture is shuffled about. Performances continue this weekend and next at nimbus theatre's NE Minneapolis space, with ticket prices just $15 (or $10 with a Fringe button). Definitely worth checking out for an inexpensive and entertaining night at the theater.